2 no scan Japan LV 38405 NTSC "Videos part 1" & "Nothing videos" reunit on 1 LD, sleeve show sleeve of the 2 VHS. This video was only released in Japan and USA. 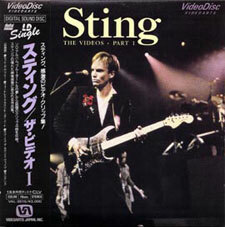 It comes with a special sleeve: a live picture of Sting with guitar. This photo was also on the sleeve of the Japanese CDv of "Bring on the night" and on the Japanese 12" of "Shadows in the rain".